Foxes go after your livestock when other, easier sources of food vanish, according to the Wildlife Hotline. However, that fact doesn't make things any easier when a fox prowls around your chicken coop. Keep foxes away from your chickens by getting creative. Employ methods including securing your chickens' home with fence, burying wire far enough down to deter a fox from digging and locking up your chicken coop at night. 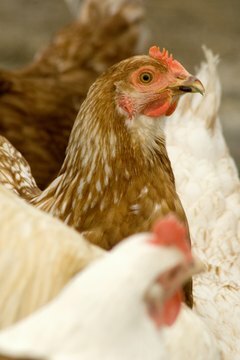 Combining these fox-ridding methods will go a long way in keeping your chickens safe. Install an electrical fence to combat foxes when chickens live on open land. You want the fence to reach a height of 7 feet with outward facing fence toppers to keep foxes and other predators from jumping over the fence. Place a thin layer of mesh on top of your fence to double the protection. The mesh covering will keep animals from squeezing through your fence holes. Bury the wire part of your fence to keep foxes from digging underneath it. Foxes can dig their way under fences that fall just to ground level. Keep foxes from forming a tunnel underneath your chicken coop by securing your wire at least 1 foot underground. Keep up maintenance on your pen to avoid future problems with foxes. Cover the top of your chicken coop to keep foxes from getting in through an open roof. Grab a hammer, pair of outside work gloves, nails and piece of plywood. Hammer your nails into the wood to secure it to the top of the chicken coop. Lock up your chicken coop at night. Employ the use of a guard dog if you feel the animal won't harm the chickens you're trying to protect. Walk the dog in different sections of your yard to confuse the fox into thinking the canine runs free. Consider placing extra fencing around the fence you already have in place to further deter foxes from nabbing your chickens. Avoid using chicken wire as a protective fence. Chicken wire keeps your livestock inside but may not keep predators out. Ever since Kelly Taylor understood what writing was about, she's enjoyed the process of it. Taylor has a high-school diploma and she took college courses along with obtaining two technical certificates. She has experience writing about gardening, spirituality, travel, science, and history through instructional websites and other publishing platforms. How Do Flying Squirrels Move Around?